Had Senzel stayed healthy last year, there's a chance he would have spent enough time in the big leagues that we wouldn't be writing about him in this space. That didn't happen. Instead, MLB.com's No. 6 overall prospect appeared in just 44 games at Triple-A Louisville because of vertigo as well as a torn tendon in his right index finger that ended his season in June. But when he did play, the 23-year-old showed his bat was just about ready for the Majors. In 171 Triple-A at-bats, Senzel hit .310/.378/.509 with six home runs and eight steals. In 455 at-bats between Class A Advanced and Double-A in 2017, he batted .321 with a .905 OPS. In fact, the only level at which he's hit for anything below .300 was a 10-game stint in Rookie ball before moving to Class A Dayton less than a month after the Reds made the Tennessee product the second pick in the 2016 Draft. That consistent offense has led the Reds to believe that their top prospect can hit for average and power at the highest level right now. 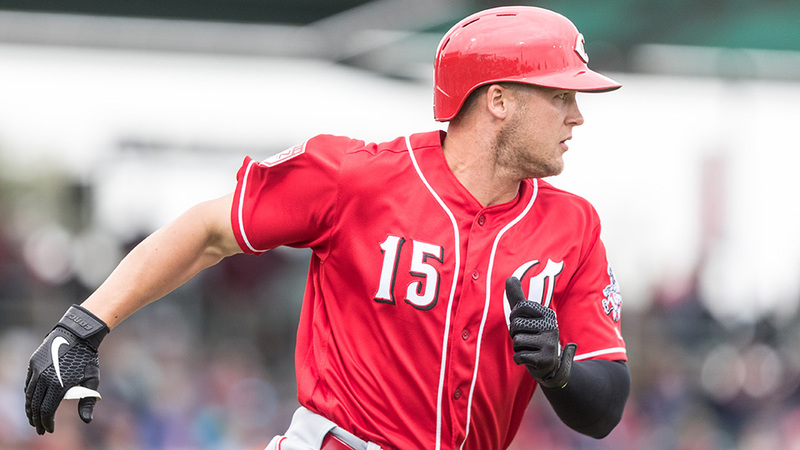 It's why, with Eugenio Suarez at third base and Scooter Gennett manning second, Cincinnati has moved Senzel -- a collegiate third baseman who played at second last year -- to center field this spring. His adjustments, according to Reds senior director of player development Eric Lee, have been "outstanding and frankly not unexpected." "It's just getting it to a point where he can confidently play that position in a way that, you know, his teammates can trust him out there on the biggest stage," Lee said. The angles and flight patterns in the outfield vary from those on the left side of the infield, but Lee pointed to Senzel's athleticism as to why those adjustments have been rather smooth so far. Any bumps along the way, though, will have to be worth what Senzel can do from the right side of home plate at Great American Ballpark. "I believe he does have the ability to hit for power," Lee said. "I do believe that he really does use the fields very well. But to me, his best quality is just the sheer quality of his at-bats. He's relentless about it. At-bat after at-bat, he doesn't give them away. It doesn't matter who's on the mound. They always look the same. It's always a battle, and he truly gets himself a good pitch to hit." The Reds will soon -- Opening Day perhaps -- begin to find out if that holds true in The Show. If and when Senzel moves back to the infield, don't be surprised if Trammell takes his spot roaming the grass. The speedy 21-year-old -- whom the Reds took 35th overall in 2016 -- has 90 stolen bases in 300 career games. His athleticism, even more so than Senzel, plays a major role in why he's a tremendous talent. "It always gave him a chance," Lee said. "He just makes adjustments really well. He does obviously have a really good mind for it, too." Trammell, baseball's No. 16 overall prospect, spent the entirety of 2018 with Class A Advanced Daytona. The Futures Game MVP notched a .375 on-base percentage and knocked 31 extra-base hits. He will likely again be tested with more seasoned competition this year at Double-A Chattanooga. If past performance is any indication, he should be just fine; Trammell posted an OBP of .374, .368 and .375 in each his three professional campaigns. The field, Lee said, is where the Reds would like to see the most growth from their No. 2 prospect. Sure, Trammell can fly. But he has a 45-grade arm. Maturation and strength training should aid development in that area. If Trammell remains average in that category, though, he could be on track for a corner spot instead of center. "It's just becoming a more and more complete defender," Lee said. "It's kind of easy to point there, not because he's lacking [defensively] necessarily, but just because offensively, he's just continued to produce and produce. ... We have every confidence that he'll be able to do it." There are two things Reds fans must know about Greene, the club's third-ranked prospect: He throws a baseball very fast and -- as of now -- he is healthy. "Everything looks good," Lee said. "He's very much on a path. I would say at this point, he's preparing himself for the season. Everything is full-go, and he's just working his way back into shape." Should that shape resemble what Greene possessed in 2018, look out. He struggled early with Class A Dayton but lowered a 14.63 April ERA to 4.48 pre-injury. He posted a 30.3 percent strikeout rate, third best among Midwest League pitchers to toss at least 60 innings. And in the Futures Game, baseball's No. 31 prospect threw 19 (!) heaters that hit triple digits. The fastest clocked in at 103.1 mph. "What he does is pretty darn good," Lee said. "There is refinement that needs to occur, like with every 19-year-old right-handed pitcher -- refinement of secondaries, continued refinement of fastball command, just being able to harness and use his considerable stuff. But it sure makes it easy that he is such a quality strike-thrower and has the ability to repeat and command, which he showed last year." India, the Reds' 2018 first-round selection (fifth overall) and fourth-ranked prospect, actually received most of his first at-bats as a pro with Class A Dayton. He played just 17 games between two levels of Rookie ball before appearing in 27 games with the Dragons. The 22-year-old right-handed batter -- equipped with the potential to hit for average and power -- possesses remarkable discipline at the plate. He hit just .240 in 150 at-bats last year but took 28 walks to raise his on-base percentage to .380. That came after a long season in which India's Florida Gators went deep into the College World Series. Now, with his body rested and his first full pro season ahead, the Reds have high goals for the No. 53 overall prospect. "I would say we expect Jon to break with our Daytona group," Lee said, "and he's going to be on a very similar path as the other high-profile guys who have done that." India could ascend quickly through the system, accelerated by a versatility to play infield slots beyond his native third base and that advanced bat. The Reds' No. 17 prospect began 2018 in the Double-A rotation. A 3.07 ERA in 16 starts earned Mella a promotion to Triple-A Louisville. He started three games for the Bats before returning to the Majors for the first time since his debut the September prior, two relief appearances that both saw runs cross the plate. His four appearances in 2018 were no less forgettable. Mella allowed nine runs in 9 1/3 innings and walked as many batters -- eight -- as he struck out. "I don't think what he needs to do is anything he can really do in the Minor Leagues," Lee said. Mella will turn 26 in August. He had been ranked as high as Cincinnati's No. 6 prospect in 2015, when he came to the organization in a trade from the Giants. His career will not be over should he fail to solidify a spot in the Major League rotation. He has good enough stuff -- a fastball that reaches 97 and two decent off-speed offerings -- that a permanent move to the bullpen could work, too. The key, Lee noted, is to throw strikes in the Majors the way he does in the Minors. "I believe he has that ability, and I think he does, too," Lee said. "He needs to continue to get those opportunities to do it." More to keep an eye on: With a mid-90s fastball that moves and improving secondary pitches, No. 5 prospect Tony Santillan will look to build on a 2018 campaign that saw him drop his walk rate to 6 percent in 11 starts at Double-A. ... Jose Siri (No. 10) is two years removed from a 20-homer, 40-steal season and is the best outfield defender in the system. His ceiling is massive, but he's been with the organization for seven years and has yet to reach Triple-A. … 2018 second-round pick Lyon Richardson (No. 11) -- signed out of high school for above slot value -- appeared in 11 games before being shut down with a sore elbow last year. The 19-year-old righty played the outfield until his senior year but already has shown a 97-mph fastball with two breaking pitches. Joe Bloss is a contributor to MiLB.com. Follow him on Twitter @jtbloss. This story was not subject to the approval of the National Association of Professional Baseball Leagues or its clubs.